It’s been four months since we kicked off the Lambs & Clams Cooking Contest with the BB&T’s Charleston Wine & Food Festival. In case you are not familiar with this contest, the winner will be awarded an all-expense paid trip to the festival in March and will have their winning dish prepared at one of the events, Pinot Envy Uncorked. It would truly be an honor to attend this event and to have one of my recipes prepared during the festival, so I would appreciate your support in the voting process. This is the last of the four challenges. 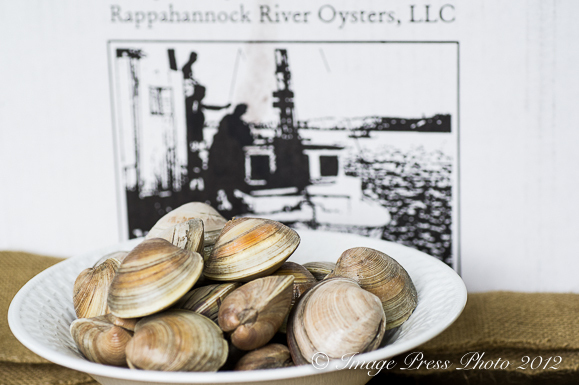 Thank you so much to Craig Rogers of Border Springs Farm in Patrick Springs, Virginia and to Travis Croxton at Rappahanock River Oysters in Topping, Virginia for coming up with the idea and for all of the fabulous products you have sent to us for our recipes. This month’s ingredients are ground lamb and Olde Salt Clams. Several of my dishes in this contest were inspired by Charleston’s history, a focus on Southern ingredients, and the regional culture. I have incorporated and supported local farmer’s and artisan’s ingredients in these recipes. During the process of making these recipes, I have purchased similar ingredients prior to receiving the shipments from Craig and Travis and have made these recipes at least two or three times to fine-tune the flavors and get it right. I have also had several taste testers judge my recipes during this process to be sure they are everything I want them to be. I know these recipes work and are delicious and I hope that you will try several in your own home. I was excited to win the first two challenges, one for my Tennessee Whiskey and Sorghum Brined Leg of Lamb and the other for Southern Rockefellas. However, the judges did not like my last dish, Epaule d’Agneau (Lamb au Vin). It was my riff on Coq au Vin. My overall score from the judges was very low, so it makes this, the final challenge, quite important. The flavors were outstanding in that lamb dish. I am not sure why they graded it as they did, but I knew I needed to create something unexpected for this round. Rustic Lambs and Clams Pâté with Lamb Crackers is my entry for this challenge. While creating a pâté may sound difficult, it is incredibly simple to make, although it could require an overnight stay in the refrigerator, depending on how you chose to finish the pâté. In addition to the lambs and clams that we received, I incorporated local ground pork from Thompson Farms in Dixie, Georgia (of course, you can use any ground pork) and chicken livers from Bell and Evans (who sell locally here in Georgia) in this recipe. You could certainly use lamb livers if they are available at your market, but you may need to adjust the seasonings. Remember, “no guts, no glory,” as the organ meat kicks up the flavors. I made the first trial run of my pâté with the meat mixture containing just ground lamb and chicken livers and the second with a mixture of ground lamb, pork, and chicken livers. The second was the preferred recipe by all, so I have gone with the latter. Since most people will have a 5-cup loaf pan, this recipe was developed for that size pan, however, you may also use a pâté terrine, if you have one. 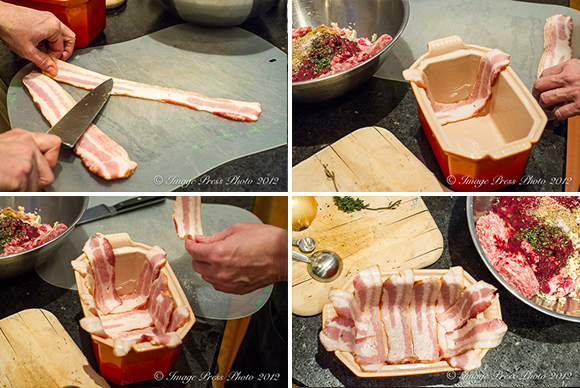 First, prepare your loaf pan or pâté terrine and line with bacon strips. 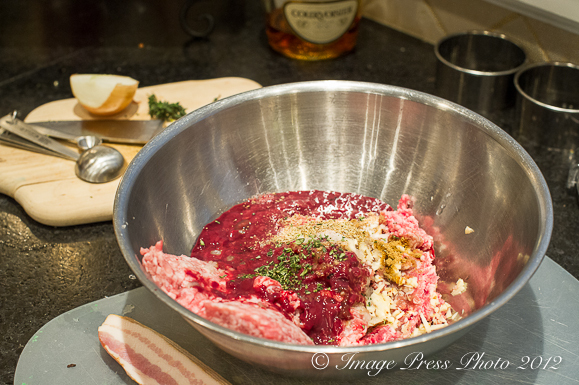 Then, combine the meats with the seasonings in a large bowl. 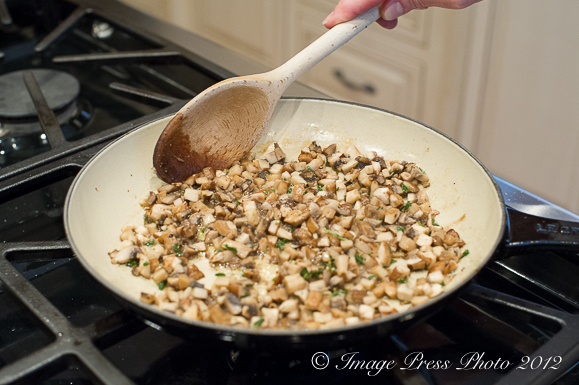 Sauté portobello mushrooms with seasonings and Cognac, followed by the clams. You just want to warm the clams and mellow the flavor of the Cognac for a minute or two, slightly reducing the liquids. Layer the meat mixture alternately with the clam mixture; be certain to press the mixture tightly into the pan after each addition. This will create the proper texture desired for the pâté. 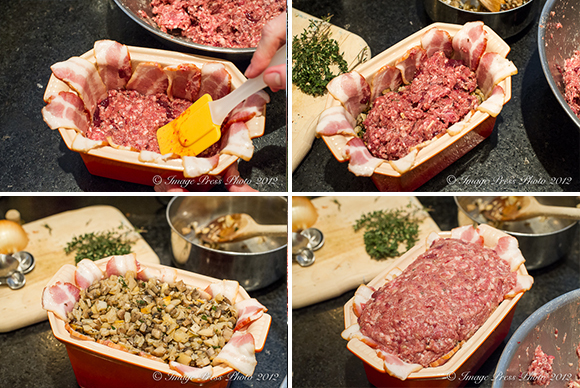 Place a bay leaf on top of the meat mixture and top with bacon slices. Seal the dish properly (tightly wrapped aluminum foil for a loaf pan or the lid and a flour paste for the pâté terrine) and set in a hot water bath in a larger container and place in the oven. Bake for two hours at 325 degrees. 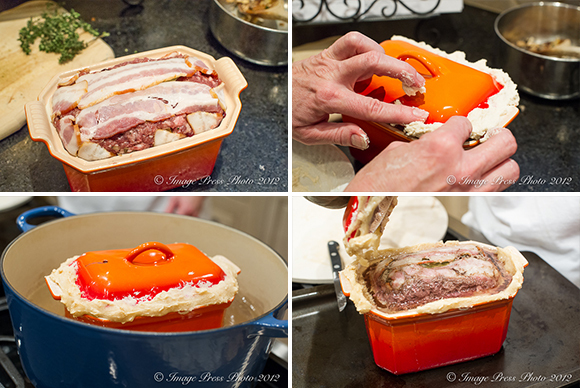 Remove the pan from the oven and let the pâté sit for a few minutes. Interesting way to prepare the 2. I’m a huge pate fan, so this is right up my alley. It’s been fun competing with you for the past 4 months. Hard to believe this is it. Best of luck to you!! Yes, I wanted to create something different with this challenge. I thought about meatloaf, sliders with fried clam “bacon,” stew, hand pies, a meat pie, or a layered dish with phyllo, but opted for pate. I figured that was somewhat unusual. It is fun that we all seem to create different dishes and have crossed over very little. It makes it interesting. It will be sad to not receive that box of lambs, clams, or oysters next month. 😉 Good luck to you, too. I voted. I have never made a pâté before, but I have a Silver Palate recipe for a rustic pâté that I have always wanted to try. OMG Gwen this is an absolutely WOWER!! I love this and wonder if I’d be up to make it. We love pâté but your flavors and use of lamb is stunning! As is the cognac geléé. And I’ll bet that sandwich is fabulous! VOTED! This looks so elegant and you’ve obviously put a lot of care and work into creating this dish. Good luck in the contest! 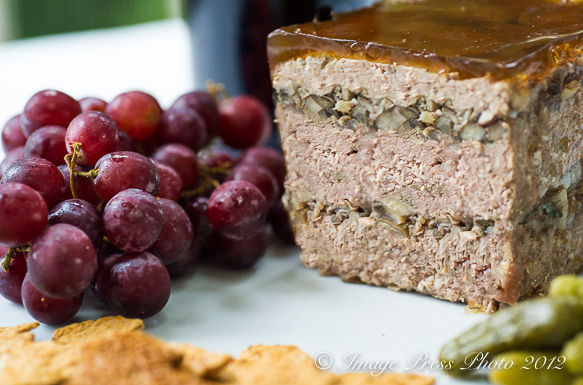 We love pate but i have never tried to make it as we live in France and have so much to choose from here. That said, I have never seen anything with clams and lamb meat in it so I couldn’t resist trying your recipe as my first attempt at pate! (i.e. something i definitely couldn’t buy). Your instructions are great, easy to follow and the result was fantastic – really original flavours and a very unexpected combination of ingredients. My husband from Normandy loved that it represented his origins (turf and surf :0) and the rest of our guests from the UK found it an excellent variation. Modifications: not by choice but of necessity. I could not get any ground lamb’s meat so tried to “mince” it myself in food processor – texture was actually a nice addition yielding a pate de campagne result (chunky bits). Could not get Portabello mushrooms so used an alpine mix (frozen no less) of girolle, cepes etc) = tasty and lastly i was out of beef stock so for the gelee i used 1/2 chicken stock and 1/2 knorr mushroom stockcube from italy = also very tasty gelee result. so yes this recipe is WONDERFUL, and easy to do even for a novice. Will be making it again without hesitation. Thank you for sharing. As you know, this was a unique recipe that was developed for a recipe contest and I had to use both the ground lamb and clams in the dish. While it was a different combination of flavors, we really enjoyed it as did our neighbors and friends. We made it twice; both times to rave reviews, so I’m please you had the same outcome. I hope you will continue to be adventurous with your pate making. We thought this one was better than most we are able to purchase, even at good specialty markets.